So Naruto just ran out of sage energy, and he’s thinking in his head “I could only do 2 swirling vortexes of death in sage mode. That means I only have four left…”. What? He’s out of sage energy! Where does he think he’s going to find the strength to do 4 more? That’s ridiculous. Or it would be if we weren’t dealing with the new…. SMART NARUTO. Fans everywhere should be baffled. But that’s enough of my sarcasm. Let’s continue with the story. The head Pain (the guy that repels and draws things) decides to physically attack Naruto. This is called a distraction play. But Naruto missed that. Anywho, Naruto pulls that giant scroll off his back and throws it to an Elder Toad so he can fight Pain. Elder Toad opens it up and summons… another Naruto! Turns out that before they left the training place, Naruto made 2 clones that have been sitting there absorbing natural energy. So they summoned one of them, clone disappears, and Naruto finds himself chock-full of sage energy again. Yay! So the 4 more is because each of the two clones gives him the ability to do the death vortex twice more. And for you uber-nerds out there, the official name of the swirling vortex is Rasen-shuriken. Anywho, he kicks the crap out of head Pain and creates a Rasen-shuriken to throw at them. And just before it connects with head Pain, the fat Pain he killed earlier jumps in front and blocks it! For review, the fat Pain can absorb any attack. He went down earlier when Naruto punched him so hard he couldn’t absorb it all and died. But he was dead. Well the distraction part of the earlier move was because the Pain that was still alive and hanging out in the back is the resurrection Pain. So R-Pain brought fat Pain back. Naruto figures all this out (there’s that thinking again!) and realizes he needs to kill R-Pain next. Cue quick thinking attack combination! Naruto creates smoke-bombs so the Pains can’t see him. Then he throws what appears to be a Rasen-shuriken which the fat Pain is set to block. 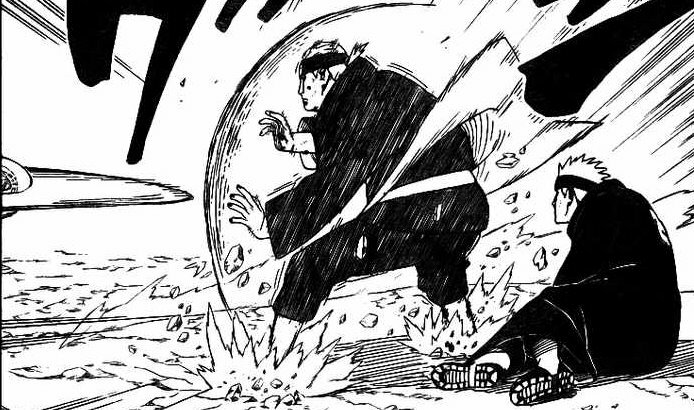 Then the rasen-shuriken turns into Naruto who just tackles the fat Pain. Then another rasen-shuriken comes up behind him ready to cut down head Pain and R-Pain… but wait! Head Pain’s powers finally start working again. Apparently they needed a lot of recouperating time after BLOWING UP THE ENTIRE VILLAGE. So he repels the attack easily. And JUST as the volume comes to an end, we see yet another Naruto falling from the sky with a double Rasengan dropping directly toward R-Pain. So he may have done it! We certainly hope it did. It was tough enough naming all the Pains as they were dying. I don’t want this fight to slowly show them all coming back around. That would just get annoying! And oddly enough, no background chatter from the peanut gallery in this one. All fighting, the whole time.